Having a cold is no fun. Sore throat, runny nose, general feeling of all-around blechiness. About the only good thing I can say about colds is that they don't last long, usually about a week. 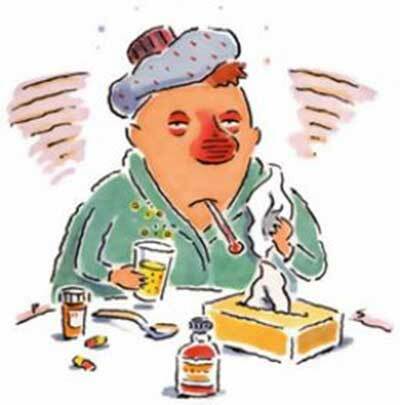 We still don't have a cure for the common cold, but it's not for lack of trying. For decades, Nobel laureate Linus Pauling promoted mega-doses of vitamin C as a way to prevent colds, but he turned out to be wrong on that one. Somewhere in the neighborhood of 200 different viruses cause us to get colds, and we don't seem to be able to get rid of any of them. 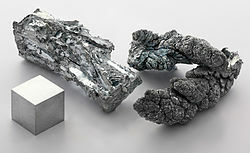 In recent years, the most popular new remedy is zinc, usually in the form of a lozenge. The evidence for zinc's effectiveness is not entirely clear, but a review published just last month, which looked at 13 different studies, concluded that zinc seems to help, just a little bit. All 13 studies were randomized controlled trials, the gold standard of research, and collectively they included 966 people. That sounds encouraging, but the benefit was disappointingly small: zinc seemed to shorten the duration of a cold by about one day. So instead of being sick for 7 days, you might be sick for 6 days. Or maybe not: Dr. Terence Davidson from UC San Diego argues that if you look at just the more rigorous studies, the effect vanishes entirely. Then there are the worrisome reports that Zicam, a zinc-based cold remedy, causes people to lose their sense of smell. (This may not sound so terrible, but some people reported a permanent loss. Imagine never being able to smell fresh-baked bread again.) In 2009, these reports led the FDA to issue a warning advising consumers to stop using three particular Zicam products. In addition to over 130 reports directly to the FDA, Zicam's manufacturer had over 800 additional complaints about loss of sense of smell. In an ironic twist, Zicam markets its products as homeopathic remedies, which means that the FDA cannot regulate them. It also means that they shouldn't contain any active ingredients, because homeopathic preparations are diluted until they contain nothing at all. But Zicam does contain zinc, quite a lot of it, and the FDA's warning letter demanded that Zicam stop marketing these products because they had never demonstrated that they were safe and effective. Zicam markets a wide range of zinc-containing products, and the FDA's warning only affected three of them. Zicam's website today states that "there is no valid, scientific evidence showing a link between Zicam and anosmia [loss of sense of smell]." Strictly speaking, this is correct, but there have been published reports suggesting a link, such as this one from 2006 and this one from 2009. These studies looked at nasal sprays, not lozenges, suggesting that the risk (if any) comes from spraying the zinc product directly up your nose. Aside: Zicam also claims that their products cure allergies too, for which there is not a shred of evidence. Their website makes the sweeping claim that "all Zicam products are both effective and safe when taken as directed." I see no reason to trust these guys. Conclusion: I'm not taking zinc. The side effects might be minimal, but the benefit is very small and possibly zero. I'll stick with hot tea, which at least makes my throat feel better. Or chicken soup. That can cure almost anything. This is a real photo. It's the cover for a new biology textbook by Carl Zimmer and Douglas Emlen. 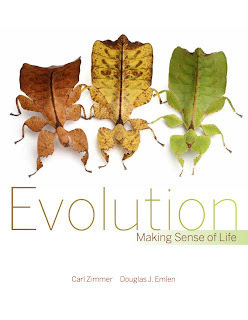 The photo shows three "walking leaves," or leaf insects, which have evolved to look just like the leaves around them. These little bugs must be one of the best examples of natural selection ever. The more closely they resemble a leaf, the more difficult it is for predators to find them. Over the millenia, the bugs who evaded predators survived better, and eventually walking leaves looked like they do today. In fact, these guys have been around for a long time, at least 47 million years, according to a fossil discovery published in 2006. That paper described a fossilized leaf insect found in an ancient lake bed in Germany, which looks remarkably similar to its modern descendants. "They teach evolution in the textbooks, but they don't teach a creation theory…. Creation has just as much right to be taught in the school system as evolution does." 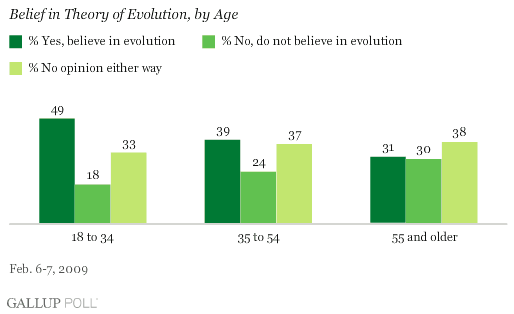 So perhaps in another hundred years or so, Americans will start to "get" evolution. But it might take longer: apparently 18% of Americans still believe that the sun revolves around the earth. So it's taken us 500 years to get to 80% for that one.